UPDATE: Now back in stock!!! THIS BOWL WILL ATTACH TO THE BOSCH UNIVERSAL (MUM6***), THE NEW BOSCH UNIVERSAL PLUS (MUM6N**), & ALSO FITS OLDER UM3 MODELS. IF YOUR CURRENT SPLASH RING HAS 3 LOCKS (YOUR BOWL HAS 3 PINS) YOU WILL NEED TO ADD A SPLASH RING. THIS IS A FOUR PIN BOWL (MEANING THE LID LOCKS IN FOUR PLACES) PREVIOUS BOWLS HAD ONLY 3 PINS (MUM6*** & UM3). Includes removable center post with twist lock feature. Bowl only. 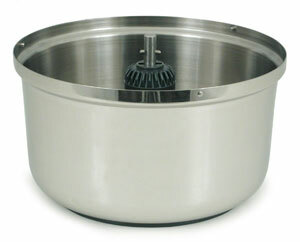 Uses standard Universal bowl mixing parts (cover, 4-pin splash ring, dough hook, whips). 18/10 surgical stainless steel. CLICK PICTURES TO ORDER / VIEW OTHER BOWL ACCESSORIES!